Those of you who live the cowboy and ranching life know that there’s a lot more to it than what they put on the cover of magazines. It can be beautiful and rewarding, yes, but it can also be hard and miserable at times. 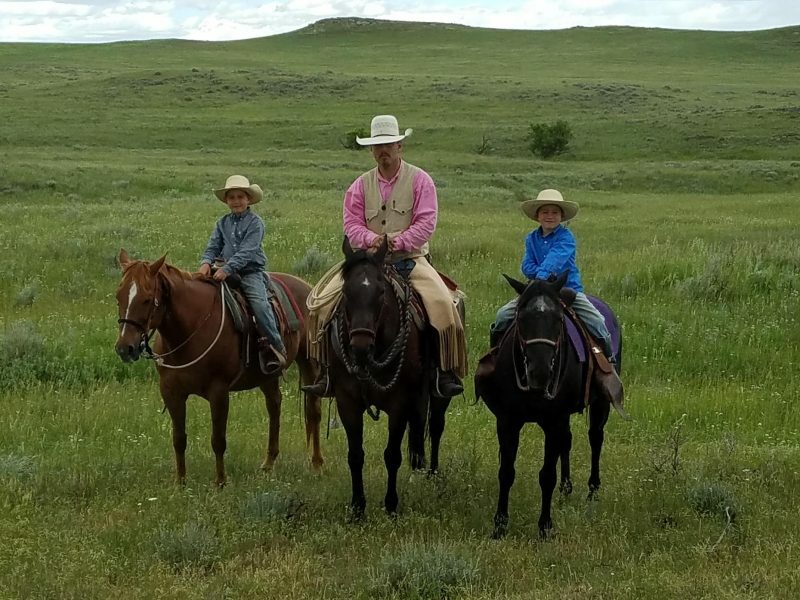 My little grandsons, ages six and seven, are staying for part of the summer and learning that it’s not all just riding their horses around and going fishing. There are things that have to be done and only so many hours in a day to do them, so we start early and end late, sometimes eating supper after it’s too dark to see. We received a couple of loads of cow/calf pairs recently. They unloaded into the working corrals and it was a beautiful 80 degrees. We let them mother up and rest a bit, so it was actually up to about 84 by the time we stepped on our horses and opened the gates to trail them to the pasture they belong in. The little boys were pretty excited about getting to help with this job. It was pretty warm, but the cows trailed nicely and didn’t get trotty or get hot as we went along. A nice light breeze kept it comfortable for horses and cowboys alike. A dam near a corner of the pasture was our goal. The cows could water there, calves would be ready to nurse and lay down for a bit after their walk, and it would be a nice place to hold them until we knew they were all paired up and settled in on grass. I’d been eyeing a bank of clouds that were rapidly building in the west, but since it hadn’t been in the habit of raining lately, I didn’t think it would be a concern. It was a warm day and even if it rained, we wouldn’t melt. As we watched, though, those clouds really picked up the pace and were coming quickly toward us and looking ugly. About 2/3 of the way to the dam, they got to us. Suddenly, the wind was shrieking and it turned loose with a wall of rain. The temperature actually dropped over 30 degrees in mere moments and we were all instantly soaked to the skin. The horses wanted nothing more than to turn their butts to that wind and hunker up, but the cows sure didn’t, so I hollered at the boys to keep their old mares moving and we kept the cows headed to the creek bottom by the dam. It was a challenge just keeping pointed into the hurricane and our hats went from shade to blindfolds/wings in seconds, so we had to hang onto them or face never seeing them again. It got cold. Drenched summer shirts just don’t turn much wind and it was only 51 degrees, according to a pickup thermometer nearby. We got the cows to the creek bottom and let the little boys get down behind the dam itself to get out of the wind. They didn’t have a corner on the market on being chilled to the bone, I’m here to tell you. We had to keep turning the cows back into themselves as the wind and rain had them wanting to travel so there was no getting out of the wind for the rest of us. The rain finally stopped, but the wind kept blowing, thus maintaining our core body temp at less than factory settings. Of course, riding with one arm holding your hat on is also warmer, so it was pleasant, to say the least. But, the grownup cowboys had been through unpleasant conditions before and knew we would survive. I don’t think the little cowboys were too sure they would. After what seemed like hours (days to two little boys), we got the cows settled and were able to ride back to the pens to get the pickup and trailer. Getting our backs to that wind sure helped, but it was still chilly. As we rode up to the trailer, I told the boys to slide off their horses and we’d put them in the trailer. The littlest said he couldn’t let go of his reins. I could relate. My hands were also so cold they were clenched up. We were all shivering with textbook hypothermia, but we finally managed to dismount. We loaded our horses and one boy got in that pickup with his Dad and the other got in a pickup with me. My little cowboy got to put a warm coat on that I keep in that pickup. By the time we’d driven back over to the cows and parked to watch them and be sure they were okay, the heaters were doing their magic and my little guy was able to visit with me. We watched the cows for a while and decided they were indeed mothered up and content to graze, so we headed home. I took the pickup and trailer with the horses and the grandboys while their Dad fixed some fence that the antelope had gone through. We talked about the storm and they were pretty awed by how fast things changed and of course, how cold they got. They talked about naughty old mares who didn’t want to take orders from little boys and we talked about why we had to make sure the cows knew where their calves were. I explained why we had to stay there, despite the wind and rain, to make sure the cows and calves were okay. They seemed to understand that. Yep. I think they’re hooked. Hours of abject misery hadn’t dampened their enthusiasm for riding. Mine, on the other hand, had passed for the day for some reason.